"Next steps" are the tasks delegated to attendees at the close of a meeting. Next steps often result in deliverables. I believe "next steps" and "action items" are synonymous. Do humanity a favor and avoid both. The end result, the bottom line, etc. ad infinitum, ad nauseam. "Net-net, we're still ahead." A wonderfully prosaic term from economics describing how some products or services become more useful as the number of users rises. Online auctions (eBay), operating systems (Windows), and social networks (Facebook) are three oft-used examples. "Let's discuss this offline." Euphemism frequently uttered in long office meetings meaning: "Let's discuss this later in private because you're way off topic again, idiot." How an action will be perceived by the outside world. For example, treating your customers like crap will be perceived as "bad." Out of touch or out of the office for a few days. To conduct a layer-by-layer analysis of a complex problem and in the process, reduce yourself to tears. A euphemistic way of saying to micro-manage, berate, motivate, psychologically manipulate, threaten, and then fire someone. A "repurposed" UNIX command meaning to send a message to another computer and wait for acknowledgment, ping means to follow up with someone via email on an urgent, but arcane matter and wait interminably for a reply. "I'll ping Henry on the Ewok matter." The modern-day antonym of "reactive." Rumor has it that this gem was created in the 1970s out of the parts of lesser words. An fugly word meaning "turn into a product." Why should software vendors offer free technical support when desperate users will pay $3 a minute for help? If your people are too daft to do something correctly, maybe you should look to software programs to automate the task. If you follow this approach, you are completing the task "programmatically." Ugh. Everyone in business is always looking for "quick wins," small steps or initiatives that will produce immediate, positive results. To increase over time. "We intend to ramp up production in anticipation of holiday demand." Just try not to cramp up. To call or email. For this one, we can blame those old AT&T ads that encouraged folks to "reach out and touch someone." Obviously, you can't actually reach out and TOUCH anyone due to your company's stringent sexual-harrassent policy. But you can "reach out" (but, again, no touching) to a co-worker for information, support, or to start one of those crucial conversations. But keep any interaction to a phone call or email just to be on the safe side. Everyone probably has an intuitive understanding of what is meant by "real-time," but that hasn't stopped many companies and consultants from using the term to describe a quixotic concept whereby a company's data is always up-to-date and available to whomever needs it, whenever they need it. To take a process or system designed for one task and use it for another -- usually in way unforeseen by its creators. In the fast-moving Internet economy, repurposing has become a viable substitute for true innovation. Typically used in reference to software, this classic means "not buggy and not a huge waste of resources." Or more precisely, something that works well even under extreme conditions. Companies are constantly introducing new products and services that you don't want or need. The elaborate process of introducing something new is a "roll-out." The verb form is used thusly: "We rolled this piece of crap out to the curbside." Describes how flexible a system is in response to increases in scale (number of users, hits, etc.). It might also have something to do with mountain climbing. The holy grail with ERP and other complex systems is to produce a "seamless end-to-end solution." The seams are the bottomless pits of hell into which your data falls when transferred from one end of the solution to the other. See also the entries for "end-to-end" and "solution." A meeting where big-shot execs ignore the normal corporate hierarchy, jump down a level or two, and slum it with the plebs. To share a document or plan within an organization, in the vain hope of getting actionable feedback from your "peers." Also, the act of taking Fido to the park to get him used to other dogs. Companies no longer sell products or services; they sell "solutions," which are products or services, but more expensive. To build every aspect of something from beginning to end. An integrated approach. Oh, the hubris of it all. The final frontier? Are you daft? No, just the niche or market segment your company currently inhabits or hopes to enter. Or, as your CEO might put it, "How can we leverage our core competencies to enter the web-services space?" We can thank McDonald's for this one. It's used to refer to anything proprietary. The essential points of a presentation, activity, etc. that the author hopes you will "take away." Also has something to do with food in the Queen's English. 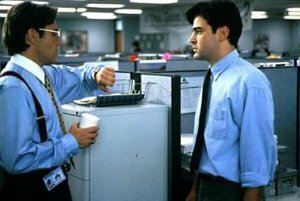 Click here for a thorough explanation of TPS Reports. Something you should be trying to gain right now. See "Gain Traction"
Wouldn't it be great if you could buy a complex system or piece of software, plug it in, flip a switch and be off and running? Oh poor Odysseus, you have once again been beguiled by the IT sirens' song. Keep dreaming. What's the point? No, really, that's what it means. The unique set of benefits that you offer to customers to sucker them into buying your product or service. Sometimes shortened to "value prop," as in "What's your value prop?" Word. I'm not sure I want to touch this one, but apparently this means a human signature, as opposed to an electronic one. I mean, do you plebs still sign stuff? You, me, your grandma, everyone (assuming you're a carbon-based life form). That is, a human-based solution, as opposed to a hardware, or silicon-based, solution. It's a win for us; it's a win for them. Everyone's happy and drinking the Kool-Aid. Means you're best in class, a benchmark. If your product, service or solution ain't world-class, you might as well close up shop and go home. Luckily, everything at your corporation is either world-class now, or will be by next quarter. Or at least that's what management's been telling everyone.